Also close by are several shopping areas including the Grand Village and Tanger Mall and a host of great restaurants. 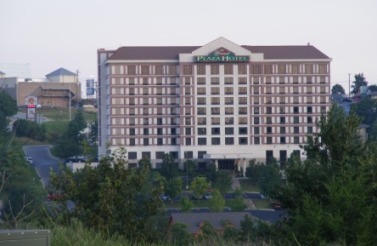 Everything is pretty close in Branson and you have great access from the hotel to any part of town. Some of the roads with less traffic are easy to get to from where you are. Also close by are plenty of restaurants such as Pancho Villa Tex Mex, Florentina's Ristorante Italiano, Buckingham's Steak House, Andy William's Moon River Grille and Mel's Hard Luck Diner with the singing servers plus many more. And if you want a special treat after the show, a favorite spot is Cakes n' Cream Ice cream Parlor on the strip in front of the hotel.